I’m still bringing in fabric from the pile my friend gave me. Last week it was 11.5 yards. I tell you it adds up fast. On the other hand, I cut most of the remaining pieces for my DWR. I also made the weekly SBS block and the last of the SBS swap blocks. I used the top piece of fabric in those. It was just perfect. Check out how others are doing over at Patchwork Times. I love to page thru everyone's blogs. Planned quilts, quilts that aren't quite "speaking" to you yet, your sewing spaces. 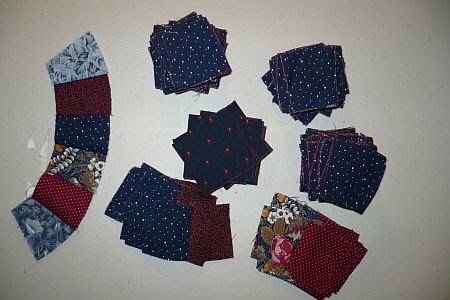 I have several of those quilts planned too, fabric bought, packaged up with the instructions!